Up until a few months ago, he was doing pretty well for himself. 11 of racing’s hottest fillies testing positive for steroids. The case has spilled into the press as perhaps the biggest doping scandal in racing history. Drawing outrage from the stable owner, racing fans, and making headlines around the globe! As another trainer told the BBC recently, “Without a doubt ... an unfair advantage is sought by using these drugs”. Surely, this trainer knew the consequences of his actions. Was it worth the risk to his future – and the integrity of the sport – to win ... at any cost? Everyone claims they would never cheat. What if there were no way to get caught? No consequences even if you did get caught? A reserved spot waiting for you right here in the Winner’s Circle. 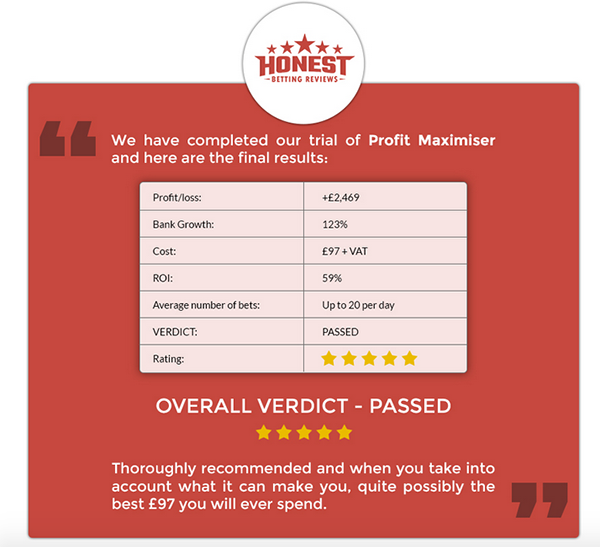 A bonus loophole I revealed to thousands of stunned punters who now make a tax free profit from offers I prescreened and tested myself ... simply by checking their email every day! At first, people couldn’t believe how simple it was to get paid. But like every steady fix ... soon, it just wasn’t enough. And although my clients were already pocketing a pretty penny, I noticed some were getting greedy. I gave them access to my secret software – allowing them work out deals for themselves! 100% tax-free profits any time, day or night – unlimited access to hundreds of bets, updated in real time ... 24 hours per day. A lot of people made a lot of easy money. They still are ... in fact, I get emails every day from overjoyed clients. But there’s one thing I hear daily that really got me thinking. Really makes me question if I’m doing enough for my clients. If I’m truly maximising their opportunity and profits. Squeezing every pence and pound from every last bonus. Hey Mike... What else have you got for me? What else have I got?? The odds must be perfectly balanced ... the timing perfectly played. It’s boring work, but to keep myself from getting knackered, I sometimes take a break and work out other offers just for fun. No high stakes ... No arbs. Just a quick way to pass the time and make a few quid in the process. But a few months ago, I began noticing something strange. It seems the “few quid” I was making with these “fun” offers were actually starting to add up. A little at a time £1.34 ... £4.20 ... £19.21. Even some higher winnings started creeping in ... £129.21 ... £140.57. ... and this was pure profit! So I started focusing on these "low stakes" gems. Before I knew it, I added up my little “side project,” and realised I’d profited over £1,000 – just by running down these low-risk overlooked bonuses I’d been playing with just for fun! These overlooked offers were like little firecrackers packed with explosive profits ... pure, concentrated, maximum yield. I knew I was onto something big, but knew there was no way I could offer them as a part of Bonus Bagging. Unlike Bonus Bagging – these weren't arbitrage bets – this was a real-time effort. To share this with my members, I realised I’d literally have to invite them into my office and show them first-hand how to cash in on these low-stakes profit maximisers. I needed to do something different ... I had to uncover an entirely new way of bringing this to my tribe. Something that would allow them to interact with me – one on one – as I uncovered these gems on the fly. Look, I don’t like house guests ... but. How could I reach out – take you by the hand and sit you down at my desk. Allow you to look over my shoulder and discuss with me in real-time the bookies, bonuses, and bets. Show you what to do and when to do it, in order to maximise your profits to the fullest potential. ... literally offering you total 24 hour access to my newly discovered secret stash of winnings. ... all as I sit beside you and personally guide you to your first payoff?! Well, my office is a mess ... and I do need my personal space. But after a few weeks of planning and preparation, I’ve finally found the answer! Come in, wipe your feet, and grab a pint. I’m about to give you the insider’s edge. Today, I’m offering something that has never been done before in the world of matched betting. Designed to offer unprecedented access to every sport, casino, and financial spread-betting program I personally use to generate, tax-free profits – in my spare time! You’ll literally watch over my shoulder as I guide you through the process of making your first profit. Including the incredible new “secret opportunity” I’ve just cracked! This new offer has been overlooked by every other so-called “insider” because they can’t get it right ... I’ve cracked the code, and I’m going to let you in on the secret! Log into the Profit Maximiser membership site. The first thing you’ll see is a step-by-step guide to using the site and setting up your accounts securely. Right away you’ll find some bets I’ve pre-screened and set up for you to make back your membership fee – within your first few hours online! Within minutes you’ll be taking advantage of your first offers – everything is laid out for you to dig in and start making money right away. You’ll have instant access to the private membership website – this is where myself and other members hang out. My bonus emails – every few days you’ll receive the latest bonus offers in your inbox ... complete with full written and video instructions that explain exactly how they work. State of the art betting software - all of the bets are found for you so you don't need to lift a finger. In fact, the software will compare hundreds of bets instantly, and will flag up the best bets straight away without the need for scouring different sites. Betfair Alliance Software - Place your Betfair lay bets directly within the software without ever having to open up Betfair. Secure the best lay odds effortlessly with a single click of your mouse. The Alliance Software has been approved by the Betfair API team. 0% Commission - All bets placed with the Smarkets Betting Exchange will be commission free (subject to Smarkets terms and conditions). This includes new & existing Smarkets customers. Think of the saving you will make just from this feature alone (possibly more than the cost of Profit Maximiser)! I’ve been using these offers to make multiple profits every day – I know they work ... I guarantee it. Here's what you have to do now. 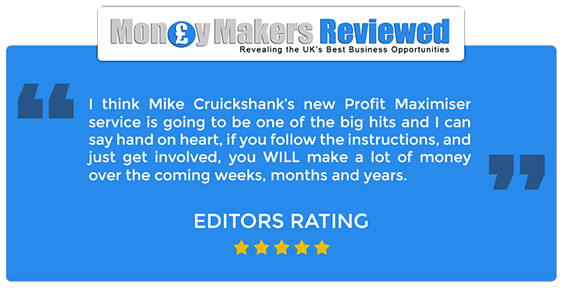 When you click the “BUY” button, you’ll be granted immediate access to the Profit Maximiser site for one year – that’s 12 months of daily profit. You’ll receive instant video instructions to setting up all your accounts. I’ll tell you where to go to place your bets. The order in which to place them to maximise your profits. With expert video & written tutorials available for every bookie, bonus, and offer available. You’ll have total access to me – the most proven and respected authority in matched betting on the ‘net – via email support. Best of all, you’ll be an instant member of a like-minded private community, interacting and supporting each other – working out strategies and sharing what works best – and what to avoid – in order to make more money, faster and easier than you ever dreamed possible! The Edge you’ve been searching for is waiting right behind this door ... and best of all – if you act right now – I’m going to make it even easier for you. I’ve never offered discounts on any of my products. My products pay for themselves – usually within the first day or two of your purchase. 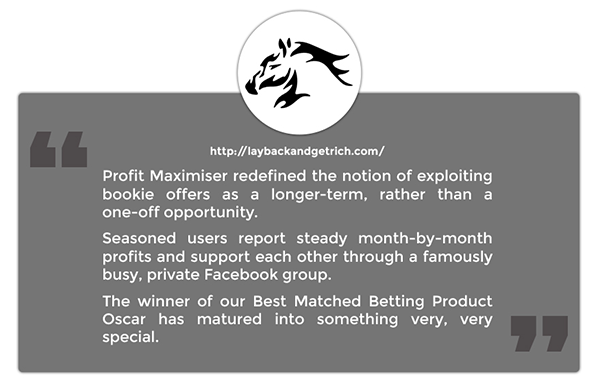 But Profit Maximiser is special ... it’s a new concept unlike anything else being offered in the marketplace. Two weeks from now, will you look at yourself and know that you took decisive action when you had the chance? Grabbing that “unfair advantage” that so many others search for in vain ... easily – and honestly – maximising your income and setting yourself up for a pattern of winning. Will you find yourself – as I did – adding up each and every pound and wondering how you became so flush with cash with such little effort? Or will you end up kicking yourself in the backside ... leaving this page, only to return later and discover your discount is expired. Or worse – returning only to discover Profit Maximiser has reached the maximum sustainable membership – and the “BUY” button replaced with a big fat CLOSED sign instead! £1 trial for 14 days followed by a £96 + VAT. Cancel anytime. There’s no difference between people who break the rules to win, and the honest punters like you and I who have the vision and foresight to strike when a golden opportunity presents itself. Well ... perhaps one small difference. But we’re all after one thing here – we’re all chasing that same rabbit. An insider’s edge ... a “fix” in the game. With Profit Maximiser, your unfair advantage is waiting for you in every offer, in every bonus – every time you log in ... the deck is stacked in your favor. Start right now, and make your first quid before you finish your next pint. We’re all in here ... waiting for you ... and winning. PS: Remember – you have absolutely nothing to lose. 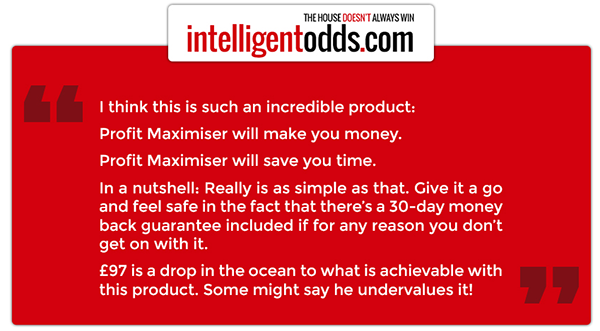 You would be daft to walk away from a golden goose like Profit Maximiser. When people get a taste of winning with an insider’s advantage, the idea of going at it without an edge becomes unthinkable. Your money is safe – and so is mine. But if Profit Maximiser makes you nervous ... if you become paranoid and start thinking to yourself ... “Winning shouldn’t be this simple...” then God bless, – let me know within the trial period, and I’ll refund every bit of your purchase. There’s simply zero risk to joining right now. PPS: Remember you won’t ever find me offering another deal like this – period. So before that deal expires – or before demand requires me to lock the doors for the next 12 months on this offer – you’ll want to get in the game today.